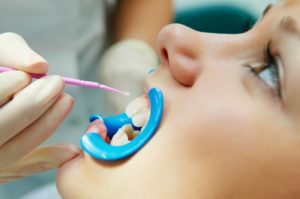 How Does Teeth Whitening in Columbia Enhance My Smile? Cosmetic dentistry has become increasingly popular over the years, quickly turning into a multi-billion dollar industry. Out of all the cosmetic treatments available, the most popular one by far is teeth whitening. Most people consider a white smile to be more attractive while others associate it with increased professionalism. But how is teeth whitening done? What is happening that makes deep stains underneath enamel disappear like magic? Today, a dentist explains exactly how teeth whitening in Columbia makes your smile brighter than ever. Before we can explain the process of whitening, it’s important that you understand how teeth become stained in the first place. For example, extrinsic stains include stains that only sit on the surface of teeth and rest inside its many microscopic cracks and crevices. These stains are easily removed by brushing or using a whitening toothpaste or mouthwash. In comparison, intrinsic stains exist underneath enamel inside the many tubules of dentin. Furthermore, the cause of the stains make a big difference in teeth whitening’s effectiveness. For example, stains caused by coffee and wine that set inside teeth are often easier to remove than stains caused by tobacco or tetracycline, a common antibiotic. The source and type of stains apparent will largely influence the technique the dentist uses to break them down. Since intrinsic stains are past enamel, teeth whitening treatments need to be designed to travel through enamel in order to reach the dentin layer of teeth. This is typically done through the use of bleaching ingredients like carbamide peroxide and hydrogen peroxide, both containing bleaching concentrations of between 10 and 22 percent. These strengths are not available in stores and only through dental offices. These processes also utilize LED lights in order to activate the gel once applied to teeth. To prevent gum irritation, they use a dental dam that blocks the gums and tongue from the gel. This also works to prevent air from reaching the bleaching gel and reducing its effectiveness. If you’re ready to whiten your teeth multiple shades, you’ll first need to determine which treatment is best for your needs. One of the most popular forms of whitening is in-office whitening. This usually takes about an hour to complete depending on how many consecutive sessions you have time to do. Once the gel is applied and the LED lights are turned on, the bleach permeates through the enamel and begins breaking down stains caught in the dentin. If you want to whiten teeth on your own time, there are also take-home whitening trays and professional-grade whitening strips. These contain similar levels of bleaching strength but are intended to remove stains over a two-week period. Simply use them for an hour a day and you can get the same results on your own time! Ready to get the whiter smile of your dreams? Schedule an appointment with a dentist today! Dr. Philip Batson earned his dental degree from the University of Missouri-Kansas City School of Dentistry. He loves seeing patients’ reactions after they’ve gone through whitening treatment and works hard to make sure their expectations are met. To learn more about his practice, you can contact him through his website. Comments Off on How Does Teeth Whitening in Columbia Enhance My Smile?